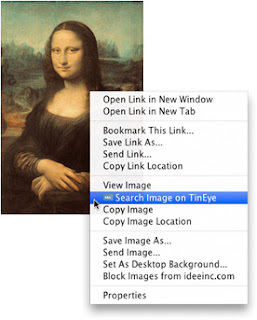 This is a image search engine launched on May 2008.TinEye is an innovative product from Idée Inc. that is not just an ordinary image search engine.Rather it has been developed to search duplicates of an image, its source on the Internet.This search engine employs image identification technology rather than keywords,watermark or metadata to search image.As the name implies, it’s search starts from an image.When an image is pointed (from local computer or image url) to it, the TinEye search engine creates a digital signature after processing.Then, it matches the result with the images already present in their database. They can show cropped images,degraded images of the original images.This can be particularly useful for those who frequently come across ripped images, originally created by them.Otherwise,You may search name of a ravishing beauty by uploading her image. Besides this, there is a FireFox addon that lets you search any image on a website just by right clicking on it.